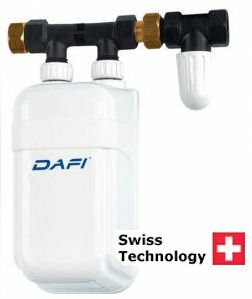 DAFI energy saving water heaters can be installed above, or under your basin or sink. Shower installations are also possible, but never inside the shower cubicle. Installation of your water heater in the ceiling or behind the wall, or in a cupboard next to the shower should be considered. point of use as possible to minimise pipeline heat loss. to be lagged and insulated. be too high, a pressure reducing valve must be installed. 3. Water quality e.g. mains supply, borehole, river etc. Installing the DAFI energy saving water heater is not complicated, but it needs to installed by a professional plumber and electrician for problem-free operation. • Incoming water supply should be clean and without any suspended solids or organic materials. • The maximum operating pressure of all DAFI Heater models is 600 kPa (6 Bar). • Heater manifold nut assembly must only to be tightened with the spanner supplied in each box. • A cut-off valve should be installed on the water inlet line to the DAFI heater. 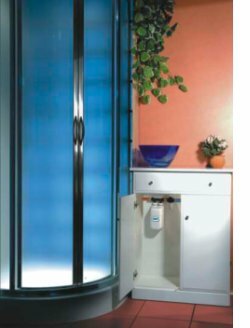 • All heater units for under sink installation can be installed at any angle. All plumbing accessories and electric connections are included in the set. usage will further reduce heat loss and save more energy. • Beware of over tightening of taps on the 3.7kW model. 1. Each heater unit is to be wired to the Distribution Board via the existing Earth Leakage System. 2. A suitably sized wall mounted electrical isolator to be installed within 600mm above the heater unit. 3. A dedicated suitably sized breaker to be installed on the Distribution Board for each heater unit. 6. DAFI heater units are not to be connected to the electrical supply by standard 3-point wall plug. • The water pressure at point of installation should be 50kpa to 600kpa or 0.5bar to 6.0bar. • Water flow direction is as per arrow shown on top side of black tube at the back of the filter lid. rear of filter lid and rotating the tube. • Filter cartridge to be inserted with the blue rubber seal at the top end of filter housing. • Ensure that the o ring is correctly seated, before closing the filter. • Close the brass screw/ release valve, at the top of filter lid, once the filter has filled with water. This screw must be opened, to release the pressure inside the filter, when changing cartridges. • Fit the blue protective cover to the top of the filter, to complete installation. • If required, a cut-off valve can be fitted ahead of the water feed to the DAFI filter.